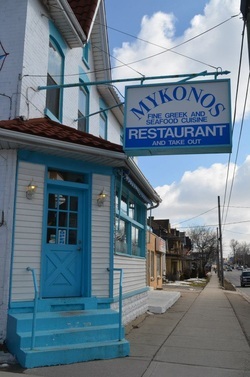 WHERE: All of our reading events are held in Mykonos Restaurant at 572 Adelaide St. North, London, Ontario. The restaurant has a large, covered terrace just behind the main restaurant, which comfortably holds 60 poetry lovers. Mediterranean food and drinks are available. Except for the coldest months, the terrace is open to the parking lot behind. Overflow parking is available across the side street and in the large lot one block north, in front of Trad’s Furniture. WHEN: From September to December, and from February to June. All events, except possibly the April one, are held on the first Wednesday of the month. THE FEATURED POET opens the event at 7:00, followed by a Q&A. OPEN MIC: Following the featured poet, open mic poets will read until 9:30 at the latest, with an intermission at about 8:00. Each poet has up to three minutes at the mic. COVER: By donation - please pay what you can by putting your contribution in the jar on the back table.